Steven is author of seven books, and I admire his approach to writing. He mixes story with essay, and has an elegant, spare style that I hope to emulate in my next book. If What We Hath Wrought is compared to his work, I’ll consider that a win. Where Good Ideas Come From is an interesting, fast paced read that outlines the kinds of environments which spawn world-changing ideas. 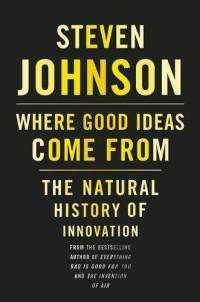 In a sense, this book is the summary of “lessons learned” from several of Johnson’s previous books, which go deep into one really big idea – The Invention of Air, for example, or the discovery of a cure for cholera. It’s also a testament to another of Johnson’s obsessions – the modern city, which he points out is a far more likely seedbed of great ideas than the isolated suburb or cabin-on-a-lake-somewhere. Johnson draws a parallel between great cities and the open web – both allow for many ideas to bump up against each other, breed, and create new forms. Some environments squelch new ideas; some environments seem to breed them effortlessly. The city and the Web have been such engines of innovation because, for complicated historical reasons, they are both environments that are powerfully suited for the creation, diffusion, and adoption of good ideas. …If there is a single maxim that runs through this book’s arguments, it is that we are often better served by connecting ideas than we are by protecting them. ….when one looks at innovation in nature and in culture, environments that build walls around good ideas tend to be less innovative in the long run than more open-ended environments. Good ideas may not want to be free, but they do want to connect, fuse, recombine. They want to reinvent themselves by crossing conceptual borders. They want to complete each other as much as they want to compete. I couldn’t help but think of the data and commercial restrictions imposed by Facebook and Apple as I read those words. As I’ve written over and over on this site, I’m dismayed by the world we’re building inside Apple’s “appworld,” on the one hand, and the trend toward planting our personal and corporate taproots too deeply in the soils of Facebook, on the other. Johnson surveys centuries of important, world changing ideas, often relating compelling personal narratives on the way to explaining how those ideas came to be not through closed, corporate R&D labs, but through unexpected collisions between passions, hobbies, coffee house conversations, and seeming coincidence. If you’re ever stuck, Johnson advises, go outside and bump into things for a while. I couldn’t agree more. One concept Johnson elucidates is the “adjacent possible,” a theory attributed to biologist Stuart Kauffman. In short, the adjacent possible is the space inhabited by “what could be” based on what currently is. In biology and chemistry, for example, it’s the potential for various combinations of molecules to build self-replicating proteins. When that occurs, new adjacent possibilities open up, to the point of an explosion in life and order. It is interesting to contemplate a tangled bank, clothed with many plants of many kinds, with birds singing on the bushes, with various insects flitting about, and with worms crawling through the damp earth, and to reflect that these elaborately constructed forms, so different from each other, and dependent upon each other in so complex a manner, have all been produced by laws acting around us. . .
Johnson also extolls the concept of “liquid networks” – where information freely flows between many minds, of “slow hunches,” where ideas develop over long periods of time, as well as the importance of noise, serendipity, and error in the development of good ideas. He explores “exaptation” – the repurposing of one idea for another use, and the concept of “platforms” that allow each of these concepts – from liquid networks to serendipity and exaptation – to blossom (Twitter is cited as such a platform). Ideas rise in crowds, as Poincaré said. They rise in liquid networks where connection is valued more than protection. So if we want to build environments that generate good ideas—whether those environments are in schools or corporations or governments or our own personal lives—we need to keep that history in mind, and not fall back on the easy assumptions that competitive markets are the only reliable source of good ideas. Yes, the market has been a great engine of innovation. But so has the reef. Amen, I say. I look forward to our great tech companies – Apple and Facebook amongst them – becoming more tangled bank than carefully pruned garden. A nice endcap to the book is a survey Johnson took of great ideas across history. He places each idea on an XY grid where an idea is either generated by an individual or a network of individuals (the X axis) and/or a commercial or non-commercial environment (the Y Axis). 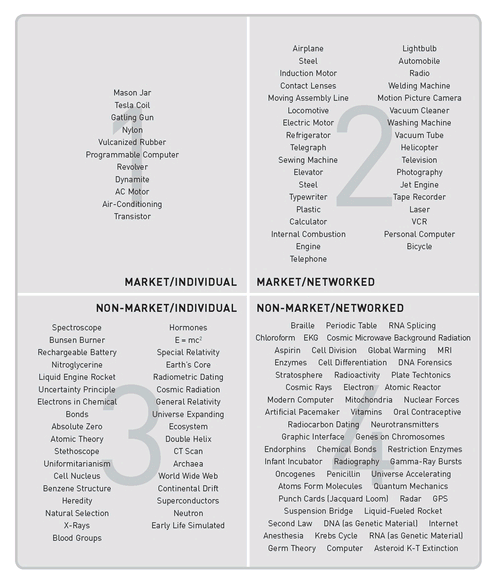 The results are pretty clear: ideas thrive in “non-market/networked” environments. This doesn’t mean those ideas don’t become the basis for commerce – quite the opposite in fact. But this is a book about how good ideas are created, not how they might be exploited. And we’d be well advised to pay attention to that as we consider how we organize our corporations, our governments, and ourselves – we have some stubborn problems to solve, and we’ll need a lot of good ideas if we’re going to solve them. Next up on the reading list: Inside Apple: How America’s Most Admired–and Secretive–Company Really Works by Adam Lashinsky, and Republic, Lost: How Money Corrupts Congress–and a Plan to Stop It, by Larry Lessig. Johnson’s work also references the idea of “putting more parts on the table,” which I love. Both. Depends on what you’re working on. Huh, I should try that (literally putting objects on the table) out. Although, I’ve already got more ideas written out than you could shake a stick at, so I should probably figure out what to do with those first. TED video – Where good ideas come from — coffee is essential! One key conclusion of this book and of Tapscott and Williams’ “Macrowikinomics: Rebooting Business and the World” is that we should build platforms for collaboration. can do where we are, and to be aware of what those around us are doing. thing: the web is a platform, a very efficient platform for innovation. In itself, it does not solve anything. Only humans do… sometimes. Previous Previous post: What Happens When Sharing Is Turned Off? People Don’t Dance.